Somewhere along the line I've developed a little nonsensical ritual of following the Exact Same Route Every Single Time through the thrift stores I frequent and it has nothing to do with efficiency. 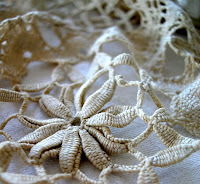 And good thing I stuck to my route because all kinds of vintage treasure turned up. Like this vintage Hendryx birdcage. This may be the thing that sends me back to selling on eBay if I can even remember how to do that, it's been so long. Pretty little vintage embroidered flower baskets that will get transformed into lavender sachets in the Doily Factory. 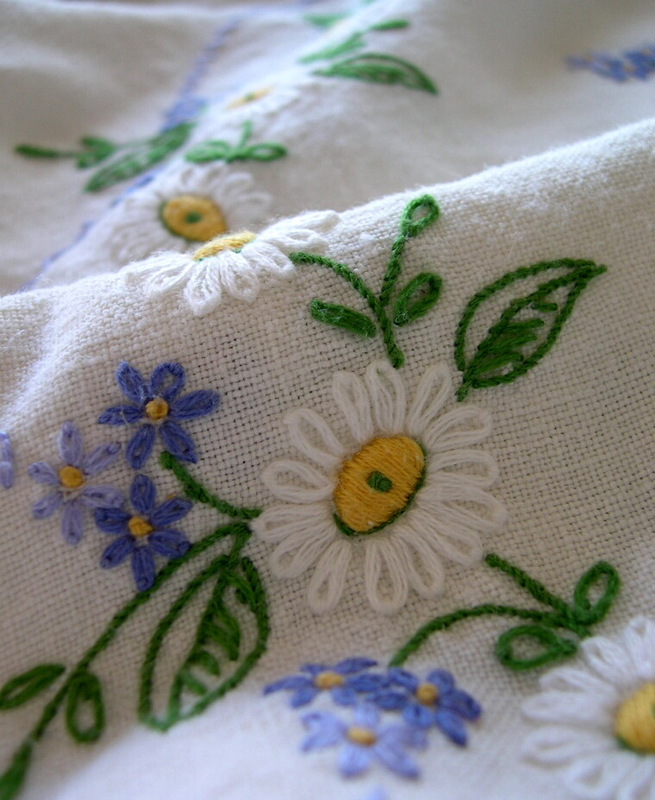 A sweet vintage embroidered tablecloth in yellow & blue, also destined to become sachets. 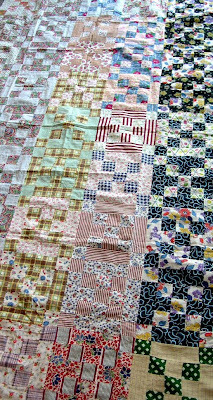 This terrific vintage feedsack quilt top -- all hand-stitched by a very industrious vintage crafter. 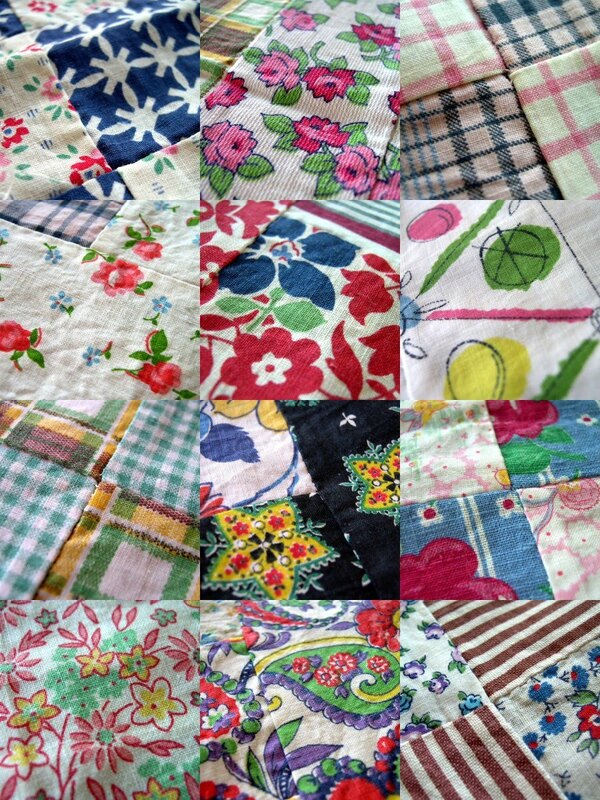 There are so many fun prints on the quilt top that I made my own little quilt with them. A digital quilt, I mean. That still counts, right? And my favorite piece of all -- just 10 cents. Hopefully these fabrics will make it through all steps of the De-Dirtification process and come out clean & damage-free. i'm in awe! what wonderful goodies! Now I know that there is a name for what I do. Thrifterstitous. I do the same thing in the antique stores that I go to also! 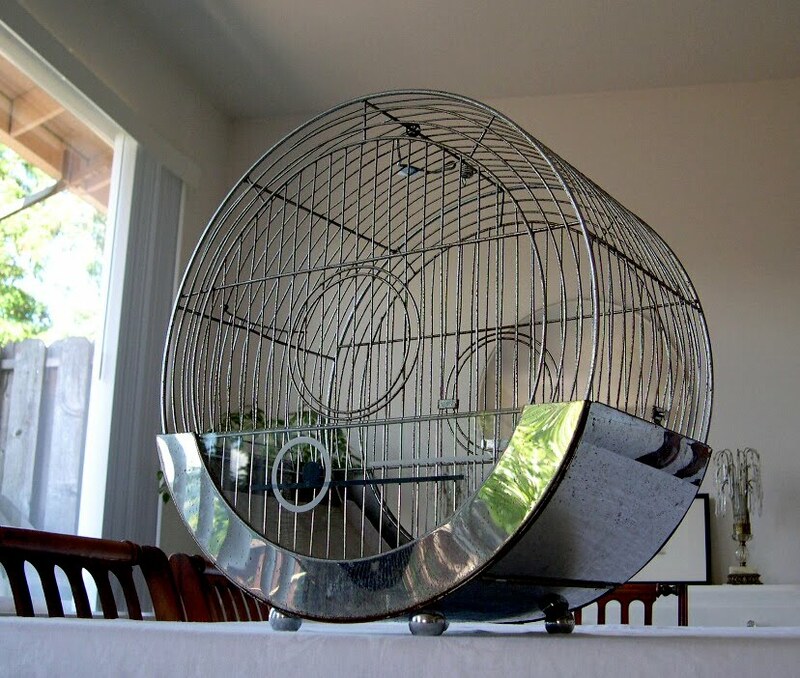 How could you ever get rid of that sweet birdcage? You need one of those pretty blue parakeets in there! 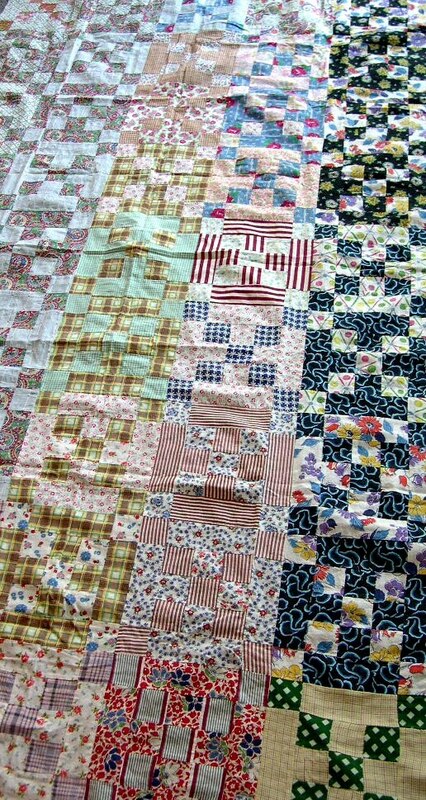 And that quilt top? Let's just say that it's so fabulous that I wouldn't dare show it to my sister the quilter. She would fall over in awe! You have some thrift store! Wow! Love, love that birdcage. I have a vintage Hendryx cage - but this one is so fabulous looking - very deco. re-arranged Everything! It threw me completely off. My Mom would really go for that hankie. I want the quilt top. Jack Pot!! Great finds...I would have bought them all too! Wow! You did good. Realllll good!! Love that lace and the quilt top. Actually, you really cleaned up on this go-round. What fun stuff. Don't you love to just pile it up and sit back and look at it?? yeah. me too. So, I'm not the only one...thank you for giving it a name. The bird cage is absolutely wonderful. I could never let that go!! Great finds all around. Love the birdcage, but the quilt top has to be my favorite! Loving the BIRD CAGE...it is TWEET! I totally am Thrifterstitous too...the same ROUTE every time. My friends and my mom are used to this quirk and just let me lead the way. Quirky, but I need all the luck I can get. hooray for fun posts with made-up words. just my style! My thrifting route lately seems to consist of bolting to the door to get out. Had I found anything remotely close to what you found, though, I'd be thrifterspicious (or whatever that word is!) too. thriftstitious? Absolutely. I walk through each store the same way every time. I visit the shops on certain days. I drive the same route. I heard recently that Michael Jordan created the baggy basketball shorts fashion because the whole time, he was wearing his college shorts underneath his pro jersey for luck. You were obviously wearing those North Carolina shorty-shorts when you found that birdcage! I love looking at your beautiful finds! Isn't it fun, never knowing what fabulous things you will come home with?? :) Thanks for sharing! Great finds! 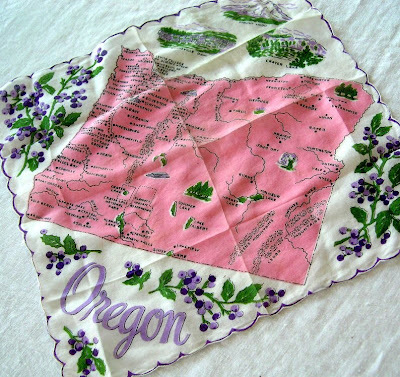 The ten-cent hankie is awesome! And I am in love with that bird cage! Oh my word, you hit the mother-load today! The quilt is amazing! 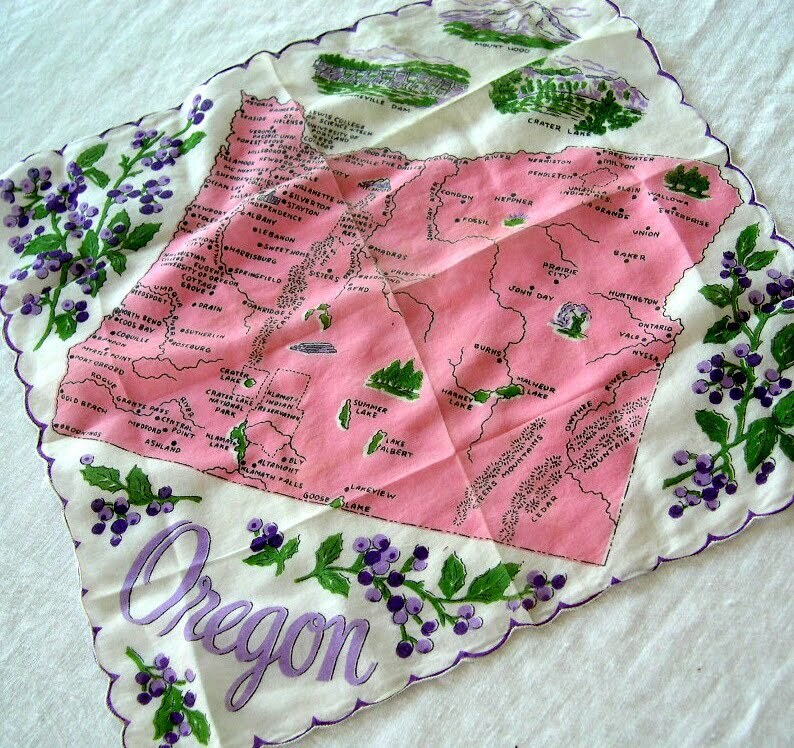 Loving the hankie too! WOWSER! Wandered over to check out your studio but on the way to that, I saw THAT BIRDCAGE - oh my whiskers!!!!! 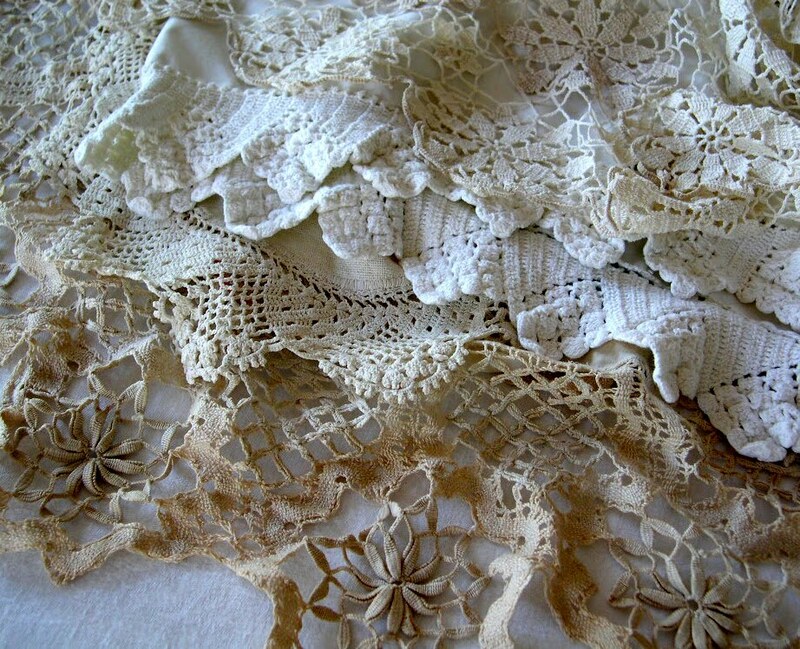 And the lace?! Oh dear, quick hide that stuff so "she" doesn't see it or "she'll" be knocking on your door. Cancel that - "she'll" be knocking your door DOWN! MOL Great finds!!!! I recommend you stick to your thrifterstitious ways. With that haul, how can you not? 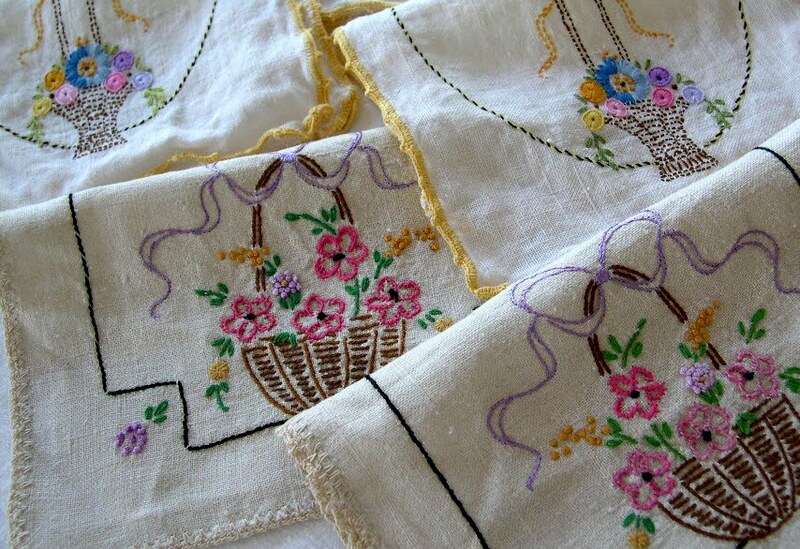 Love all vintage linens, i make bags and purses with a mixture of embroidered cloths and soft worn denim.